Tonight on ABC it’s the DANCING WITH THE STARS ALL-STARS Season 15 second double-elimination. By the end of the evening tonight we will say goodbye to not one but two more contestants. Did you see last night’s performance show? We did and we recapped it here for you. We also have all the videos of last night’s performances here! After last night’s performances Gilles Marini and Peta Murgatroyd are at the top of the leader board with a score of 99/100. 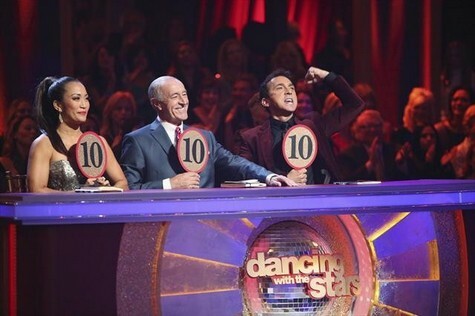 At the bottom of the leaderboard are Kirstie Alley and Maksim Chmerkovskiy with a 79/10. We’re placing our hard earned bets on Kirstie/Maks and Apolo/Karina. We conducted a poll today and 51.09% of viewers are voting that Kirstie will be going home. In second place is Emmitt Smith with 17% of the votes. There is still time to vote go HERE! Tonight’s results show will feature outstanding musical performances from Kylie Minogue and Ne-Yo. Global pop icon Minogue will perform “Locomotion” alongside the renowned “DWTS” band, accompanied by pro dancers Kym Johnson and Tristan MacManus. She has just released her latest album, “The Abbey Road Sessions,” which debuted at No. 2 in the UK. The album, which was recorded in London’s legendary Abby Road Studios with Minogue’s band and a full orchestra, features 16 classic tracks, all reworked. Also taking the stage is three-time Grammy Award-winning artist Ne-Yo, who will perform his current hit single, “Let Me Love You (Until You Learn to Love Yourself),” from his newest album, “R.E.D,” in stores now. “R.E.D,” an acronym for Realizing Every Dream, is Ne-Yo’s fifth studio album, through which he continues to embrace dance-pop while maintaining his connection to R&B. Before two couples are eliminated from the show, there will also be a special performance from pro dancers Anna Trebunskaya and Valentin Chmerkovisky, alongside special guests Tiler Peck and Robert Fairchild, principal dancers with the New York Ballet. The 4th “Macy’s Stars of Dance” performance of the season comes from the amazing cast of Disney’s smash new Broadway musical, “Newsies,” which is breaking box office records and winning Tony Awards for the best songs and best dancing on Broadway. Eighteen of some of the most talented performers audiences have ever seen will be joining the ballroom on Tuesday night, performing the thrilling “Seize the Day” in yet another must-see “Macy’s Stars of Dance” performance. Tonight’s elimination show will see two couples bite the dancing floor dust. Who will it be? Which five couples will remain for the penultimate performance show next week? Who will be the ultimate DWTS champion? Tonight’s Recap: The show opens tonight with Kylie Minoque performing The Locomotion from her Abbey Road album. Contestants pick for the other competitors a dance they have not done and a theme.